Glasgow's widening cultural status has had effects in all sorts of ways. Yes, restaurants have been bringing better and better dishes, festivals and events keep on attracting an even more diverse range of talents to our city. But who would have thought that our taste in beers and spirits would have been widened as well? It's true! And some small bars have been only too happy to meet our thirsty needs. Beers from all over the world are now ours for the taking. 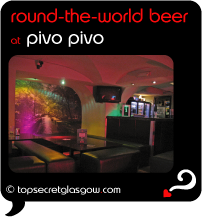 Pivo Pivo: Pizza, Burgers, Maybe Glasgows Biggest Choice of Beers? Great news! Finding this page means you can now join our VIP list for DRINK Spirits & Beers. Time to grab your very own page for DRINK Spirits & Beers. Do you have a special story about a time you decided to DRINK Spirits & Beers? A funny experience? A grand occasion? A funky photo? A personal tip? A top secret?